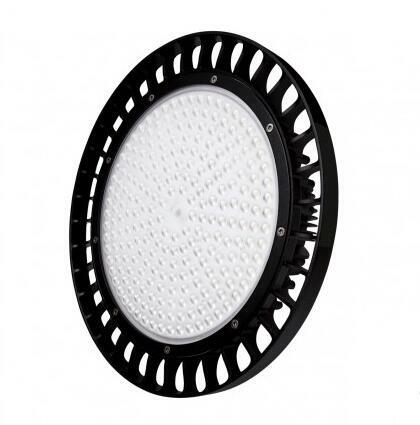 150W LED High Bay Light 90 Degree Cool White Meanwell Driver emit 18000-19000 lumens and have a 90 degree beam angle which helps to direct the light correctly whilst remaining lightweight. The high bay lights are a low cost item to run using only 150 watts of power and have a 50,000 hour lifetime which will save you a substantial amount of money over that duration. Unlike traditional halogen bulbs these bulbs emit a much cleaner light and due to the high quality LED chips used the color will never differ or gradually fade. 1. BETTER DESIGN, 150 watt Nichia SMD 3030 LED modules produce 18000-19000lm – Save even more by using a lower watt unit. Premium grade components make this an industrial grade LED High Bay or Warehouse Light. 2. SMALLER SIZE, Newly UFO style is the latest in LED technology. Smaller, longer lasting and more efficient. Only 360mm in diameter, the new design is more compact without sacrificing performance. Stop replacing old Metal Halide, HID or CFL bulbs with the new UFO High Bay LED light. 3. EASY INSTALLATION, Preinstalled Hook makes installation easy. Simple replacement for existing lights or for new installation. 4. BRIGHT AND DIRECT, 5700K color ensures a clear bright light. 90 Degree angle of light sends light downward in an efficient way. 5. BUILT TO LAST, UL,CUL,DLC,CE,CB,SAA Certified, 50000 hours lifetime. Aluminum Housing with high tech Heat Sink protectst, using Meanwell LED Driver. Better heat dissipation ensures longer LED life and safety. IP65 Waterproof for all conditions. All backed by a 5 year warranty.